Cradles and Graves: Ordinary is Extraordinary! Mei-mei is nearly two weeks old now. Yes, we still call her Mei-mei often but we're also getting used to Anastasia. She is such a sweet baby and we all just adore her. 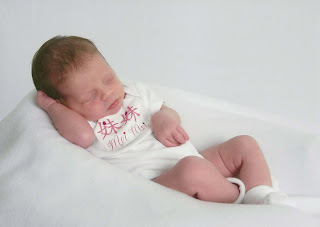 Now that I have a minute, I thought I'd post her birth story while I still remember everything. Even though the labor and birth likely would have gone the same way had I been induced, I was very glad I went into labor naturally. I had a few contractions Saturday night before 10 PM, so decided to skip my heparin shot and go right to bed. I was exhausted and that is no way to start labor. Q and I got a couple hours of sleep and by 2 AM decided to head to the hospital. Q's mom had stayed with us a few extra days, so we didn't have to worry about the kids. Driving to the hospital was easy and fast in the middle of the night on a weekend. I had a some strong contractions along the way and was very thankful we didn't have to drive into the city during rush hour! After checking in and getting hooked up to the monitors, I was very disappointed to find out I was still only dilated to 2. And did I mention I was already exhausted before this even began? So I put in a few more hours sitting on the birthing ball and in bed because I was too tired to be up and about more than that. Still stuck at two! Time loses all meaning when you're in a lot of pain, but I'm guessing it was about 9 AM before I got to 4 or 5 cm dilated. Contractions were erratic. This was looking like it would be another 30+ hour labor! The doctor suggested breaking my water and/or trying pitocin to turn things up. More speed sounded like a good idea; more pain did not. Mei-mei had been handling all the contractions without any problems, so I decided to try the strategy that finally got my first daughter born after a 30+ hour labor - an epidural. Lots of people say an epidural can slow labor down and cause distress for the baby. Not so for me. Just like last time, things moved along quickly after the epidural and baby handled it all beautifully. The doctor broke my water and a short time later added a little pitocin. It was probably around 1:30 PM that I told Q to go get the nurse because it felt like Mei-mei was moving down. Sure enough, it was time to push! For me, this part has always gone quickly - Mei-mei was out and screaming by 2:11! She was perfectly fine and healthy and so was I. No dead baby this time! Also no gushing blood during labor, no having my baby whisked off the NICU, and no problems getting the placenta out. And only a tiny first degree tear for me. It was a very ordinary labor (17 hours) and a very ordinary birth resulting in an average-sized baby. This was my last time having a baby and my first time having it all go smoothly. It was extraordinarily ordinary! Ordinary labor and birth is what I would call perfect!!! Thanks for sharing! She is so beautiful!! What a wonderful normal labor! Yay! Glad things went so well. She is beautiful! I am so, so happy for you and your family! Look at that smile! She is absolutely beautiful! What a relief that everything went well! She looks so cute! So glad she is here safely and all went well. she is such a cutie!! she really favors that left side huh? LOL sooo cute! congrats again! She is SO PRETTY!!! We still call Eskil Sparky, so I can understand still calling her Mei-mei even though you've given her such a beautiful name. I LOVE the photo of her smiling to be going home!!!! She is beautiful, I'm glad things went so well for you.